The finish of Saturday night’s dirt race at Texas Motor Speedway was as close as they get. 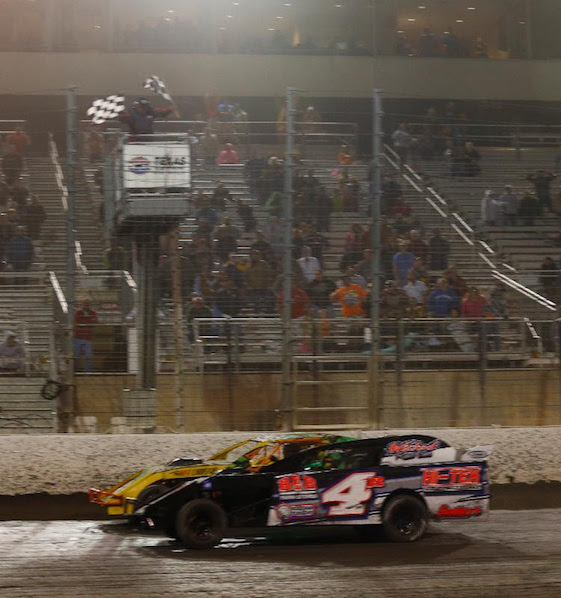 FORT WORTH, Texas – A photo finish involving a pair of Texans in the Limited Modified feature capped off the Texas World Dirt Track Championship tripleheader weekend Saturday evening at the Texas Motor Speedway Dirt Track. Pole-sitter Kevin Rowland, of Rockwall, edged defending Texas World Dirt Track Championship Limited Modified champion Nick Clinkenbeard of Weatherford and his No. 66 entry by 0.001-seconds for his first career victory at the 0.4-mile track. Rowland, who went wire-to-wire in the 40-lapper, held a comfortable lead throughout the feature until the final turn. Clinkenbeard made a hard charge to the outside as the two were racing wheel-to-wheel exiting Turn 4. Ultimately it wasn’t enough, as officials awarded the win to Rowland. Defending Lucas Oil American Sprint Car Series champion Aaron Reutzel, of Clute, drove his No. 87 Sprinter to his first victory of the season and first at the TMS Dirt Track in the 30-lap ASCS feature. Johnny Herrera in the No. 45x held the advantage early but Reutzel was able to gain momentum on a restart to overtake Herrera and never look back. Reutzel ‘s margin of victory was 0.824-seconds. Reutzel celebrated in Victory Lane by climbing onto his No. 87 and waving to the crowd. Taylor Carver, of Lockesburg, Ark., successfully defended his title as Factory Stock champion in the No. 340 entry. Carver, who won last year’s TMS Dirt Track debut for the Factory Stock division, held on to defeat Jason Gore by 0.636-seconds in the 30-lapper. With the win, Carver remains the only Factory Stock driver to win at the TMS Dirt Track. ASCS Sprint Car Feature (30 Laps) _ 1. 87-Aaron Reutzel ; 2. 45X-Johnny Herrera ; 3. 15H-Sam Hafertepe Jr. ; 4. 52-Blake Hahn ; 5. 95-Matt Covington ; 6. 17W-Harli White ; 7. 2L-Logan Forler ; 8. 2C-Wayne Johnson ; 9. 23-Seth Bergman ; 10. 17-Josh Baughman ; 11. 21T-Ray Allen Kulhanek ; 12. 28-Tommy Bryant ; 13. 02-Brandon Long ; 14. 29-Travis Rilat ; 15. 14-Channin Tankersley ; 16. 14K-Kyle Bellm ; 17. 11M-Jason McDougal ; 18. 91-Steven Russell ; 19. (DNF) 7-Kevin Ramey ; 20. (DNF) 05-Brad Loyet ; 21. (DNF) 26M-Fred Mattox ; 22. (DNF) 2X-Tucker Doughty ; 23. (DNF) 10C-Jeremy Campbell . Limited Modified Feature (40 Laps) _ 1. 4R-Kevin Rowland ; 2. 66-Nick Clinkenbeard ; 3. 15-Dennie Gieber ; 4. 15X-Tracy Denby Jr. ; 5. 9-Shane Hebert ; 6. 86J-Travis Johnson ; 7. 17-Dean Abbey ; 8. 30-Joel Couvillion ; 9. 69-Derick Grigsby ; 10. 44-Kale Westover ; 11. 26G-J.J. Jennings ; 12. 90K-Dustin Butcher [P]; 13. 232-Joel Garcia ; 14. 5W-John O. Wittington ; 15. 18-David Phillips ; 16. 103-J C Howell ; 17. 88X-R J Stroman ; 18. 23M-Jimmy Day ; 19. 30D-JoJo Paige [P]; 20. 31-Cody Smith ; 21. 18C-Tim Clonch ; 22. 20-Chase Allen ; 23. 184-Rodney White ; 24. 4-Bo Day . Factory Stock Feature (30 Laps) _ 1. 340-Taylor Carver ; 2. 721-Jason Gore ; 3. 16x-Chris Henigan ; 4. 10-Bobby Jordan ; 5. 98-Chris Davis ; 6. 19-Randy Seals ; 7. 4-Bo Day ; 8. 31- Cody Smith ; 9. 22R-Ralo Pilkington ; 10. 107-Dennis Bissonnette ; 11. 18-Craig Oakes ; 12. 6$-Chance Morris ; 13.21M-Michael Smith ; 14. 83-Chase Bresee ; 15. 71M-Tommy Davis Jr. ; 16. 27-Casey Lyles ; 17. 21J-Bubba Jones ; 18. 73-Jeff Sonntag ; 19. 66-David Bonham ; 20. 96-Trey Smitherman ; 21. 36j-Justin Whitehead ; 22. 23m-Jimmy Day ; 23. J27-Scotty Case ; 24. 21t Chad Cox . Note: Number in [Brackets] denotes starting position.